On Sunday, May 21st, Our Lady of Sacro Monte Society will host a Solemn High Mass with Gregorian chant, along with an Italian cultural festival, in honor of Our Lady Sacro Monte of Novi Velia, Salerno. 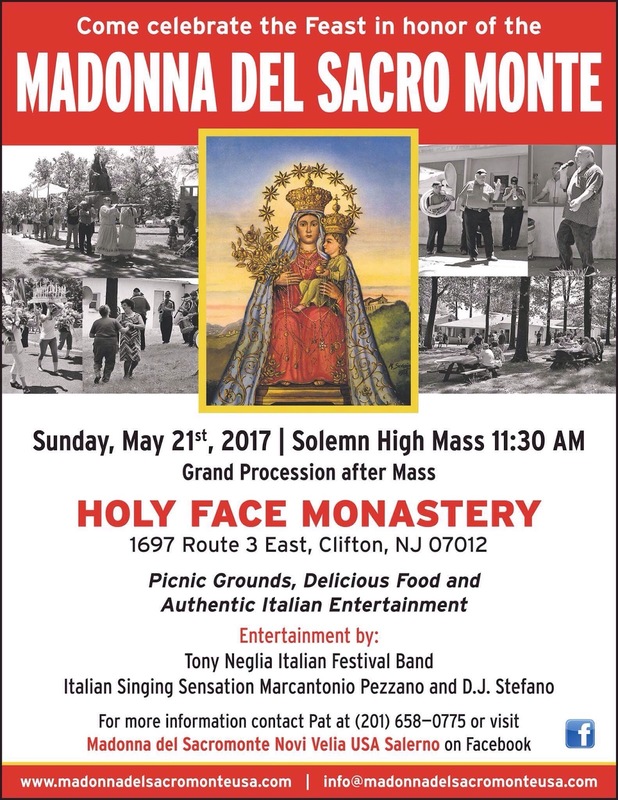 The Mass will begin at 11:30 a.m. at her shrine at Holy Face Monastery, 1697 Route 3 East, Clifton, New Jersey. Following Mass there will be a procession on the monastery grounds with the statue of Our Lady, her canopy and authentic Italian candle-houses. Food will be sold and games will held throughout the day. For more information, contact info@madonnadelsacromonteusa.com, or call Pat at 201-658-0775, or visit www.madonnadelsacromonteusa.com.